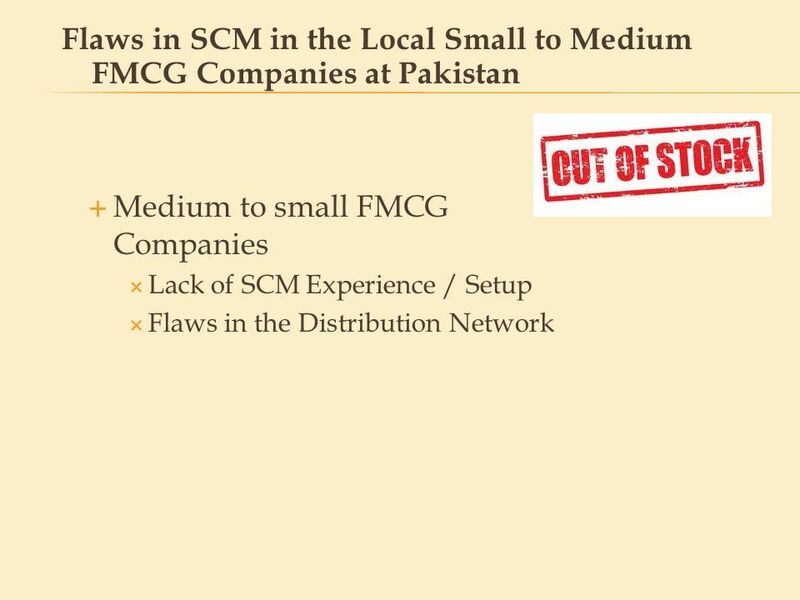 SCM in the FMCG Industry Multi-National Corporations Local FMCG Companies Small to Medium FMCG Companies - FMCG industry, alternatively called as CPG (Consumer packaged goods) industry primarily deals with the production, distribution and marketing of consumer packaged goods. The Fast Moving Consumer Goods (FMCG) are those consumables which are normally consumed by the consumers at a regular interval. Some of the prime activities of FMCG industry are selling, marketing, financing, purchasing, etc. The industry also engaged in operations, supply chain, production and general management. FMCG industry provides a wide range of consumables and accordingly the amount of money circulated against FMCG products is also very high. The competition among FMCG manufacturers is also growing and as a result of this, investment in FMCG industry is also increasing, specifically in India, where FMCG industry is regarded as the fourth largest sector with total market size of US$13.1 billion. FMCG Sector in India is estimated to grow 60% by FMCG industry is regarded as the largest sector in New Zealand which accounts for 5% of Gross Domestic Product (GDP). Common FMCG products Some common FMCG product categories include food and dairy products, glassware, paper products, pharmaceuticals, consumer electronics, packaged food products, plastic goods, printing and stationery, household products, photography, drinks etc. and some of the examples of FMCG products are coffee, tea, dry cells, greeting cards, gifts, detergents, tobacco and cigarettes, watches, soaps etc. Market potentiality of FMCG industry Some of the merits of FMCG industry, which made this industry as a potential one are low operational cost, strong distribution networks, presence of renowned FMCG companies. Population growth is another factor which is responsible behind the success of this industry. Leading FMCG companies - Some of the well known FMCG companies are Nestlé, Reckitt Benckiser, Unilever, Procter & Gamble, Coca-Cola, Pepsi etc. These companies have internationally proven SCM experience. Their vast Distribution networks, array of Products, and Internationally recognized brands have taken over the Pakistan Market. 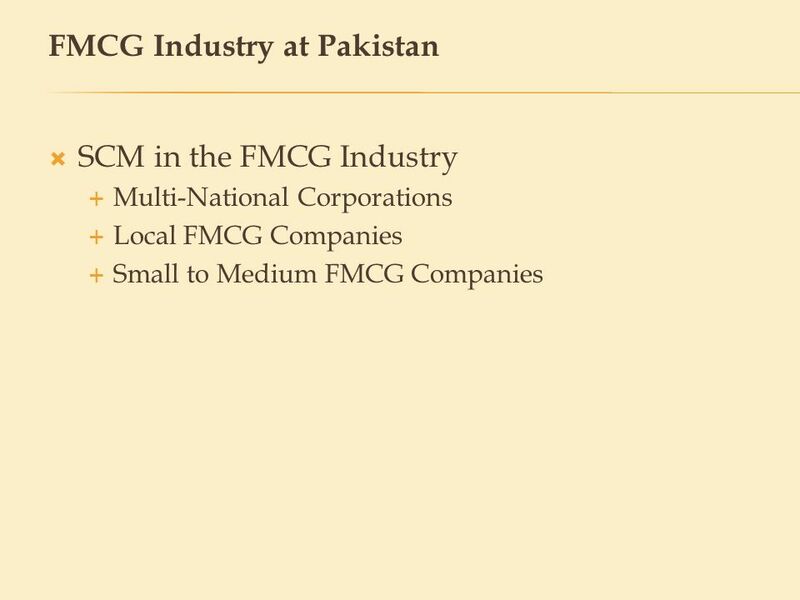 - Some of the local FMCG companies are successfully engaged in SCM/ Distribution: Dawn, Shan, National Foods, Fresher Juice, Shezan, Kolson, K&Ns Etc. These large local FMCG Companies have 3PL distribution networks, and in some cases their own Retail outlets, and are able to run successful inhouse SCM setups. Room for Improvement in Distribution Networks Multi-National Corporations Local FMCG Companies MNCs and Local Large FMCG Corporations and further improve o their Distribution networks by taking steps to improve the efficiency of their fleet and distribution patterns. Negotiate with outsourced Distributors for lower rates. Using latest technology such as RFID and tracking systems for improving efficiency. Investing in more fuel efficient vehicles. Develop new Distribution centres. Medium to small FMCG Companies Lack of SCM Experience / Setup Flaws in the Distribution Network - Media and Print advertising / Visual media pays a vital role is the promotion of Fast Moving Consumer Goods (FMCG) products, so when a consumer visits a retail store to purchase a product or sometimes we see the product on the shelf as well and when we make up our mind to purchase that particular product, the shelf is empty and “Out of Stock”, afterwards we cannot find that product. - Because these is a big flaw in the Supply Chain Management, which keeps the consistent inventory of that particular product in the store. This is the case in our example of a consumer not able to find the Local Product at the point of purchase at the local departmental store. Poor supply chain management results in late deliveries and large stockouts. Fundamentally, these effects are caused due to an inability of the firm to predict the requirement for raw material and equipment capacity together with the uncertainty associated with obtaining deliveries of products on time from its suppliers. But Flaws in Distribution Network plays a major role as well. - The reason why the Multi National Companies in the FMCG is successful, is that they manage a successful Supply Chain Management. The MNC, FMCG Companies have their own or reliable outsourced Distribution Networks and control all aspects of the channel including the point-of-purchase. Where the Consumer is bombarded with Print Adverts. Since the retailers are carrying the They normally supply the goods before the Launch of the Product and always ensure that the supply of the advertised goods are available for their target segment. 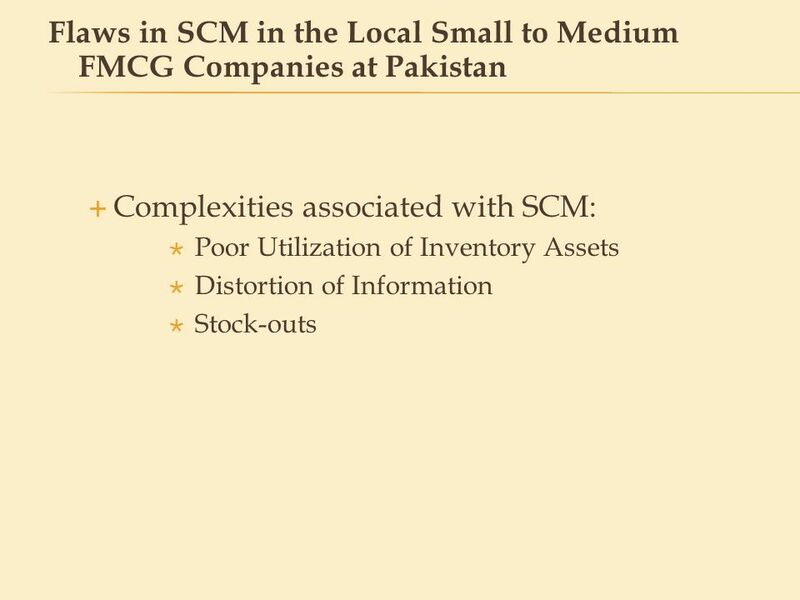 Complexities associated with SCM: Poor Utilization of Inventory Assets Distortion of Information Stock-outs Poor Utilization of Inventory Assets: One common effect of poor supply chain management is having excess inventory at various stages in the supply chain, at the same time having shortages at other parts of the supply chain. Since inventory forms a substantial part of working assets of a firm, poor management could lead to huge inefficiencies. Lee and Billington (1992) provide an excellent overview of pitfalls and opportunities associated with inventory management in supply chains. Distortion of Information: Another effect relates to lack of visibility of demand and supply information across the supply chain which causes the bull whip effect. This effect describes how a small blip in customer demands may get amplified down the supply chain because the different entities in the supply chain generate and revise their individual forecasts and do not collaborate and share actual demand information. Lee, Padmanabhan and Whang (1997) describe the causes and controls for this effect. Stock Outs: This is the case in our example of a consumer not able to find the Local Product at the point of purchase at the local departmental store. Poor supply chain management results in late deliveries and large stockouts. Fundamentally, these effects are caused due to an inability of the firm to predict the requirement for raw material and equipment capacity together with the uncertainty associated with obtaining deliveries of products on time from its suppliers. 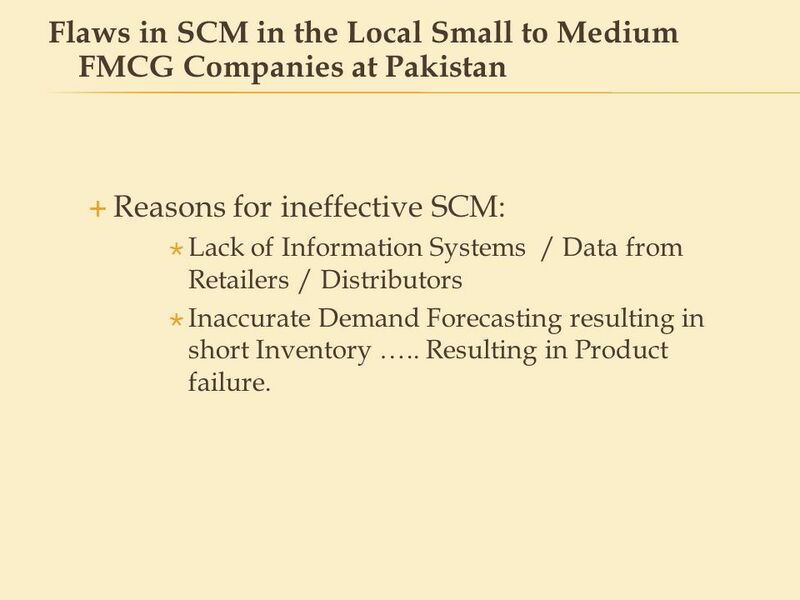 Reasons for ineffective SCM: Lack of Information Systems / Data from Retailers / Distributors Inaccurate Demand Forecasting resulting in short Inventory ….. Resulting in Product failure. Reasons for ineffective SCM: Lack of Information Systems / Data from Retailers / Distributors Inaccurate Demand Forecasting resulting in short Inventory ….. Resulting in Product failure. Hence, in today’s retail market the Product of the Local FCMG Manufacturer may only get one chance to succeed. The MNC FMCG companies have the resources to sweep your product right off the shelf. With the ineffective or lack thereof Supply Chain Management the small to Medium Local FMCG Manufacturer does not stand a chance to establish a well worth brand. 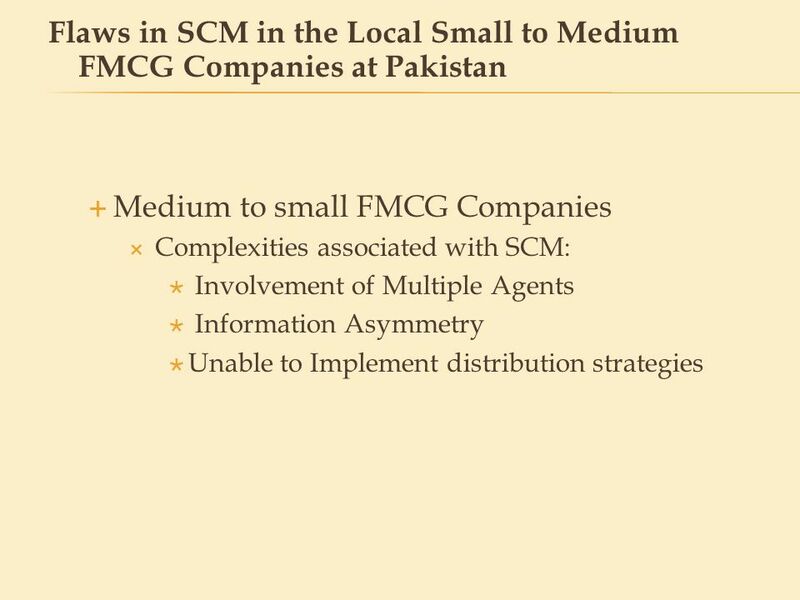 Local Small to Medium FCMG Manufacturers lack the Technical Know-how of Managing a Supply Chain. In addition there are no Industry Leaders that may provide working examples for these Companies to replicate and enhance their business. They lack the resources for latest RFID, EDI apparatus and implementation. 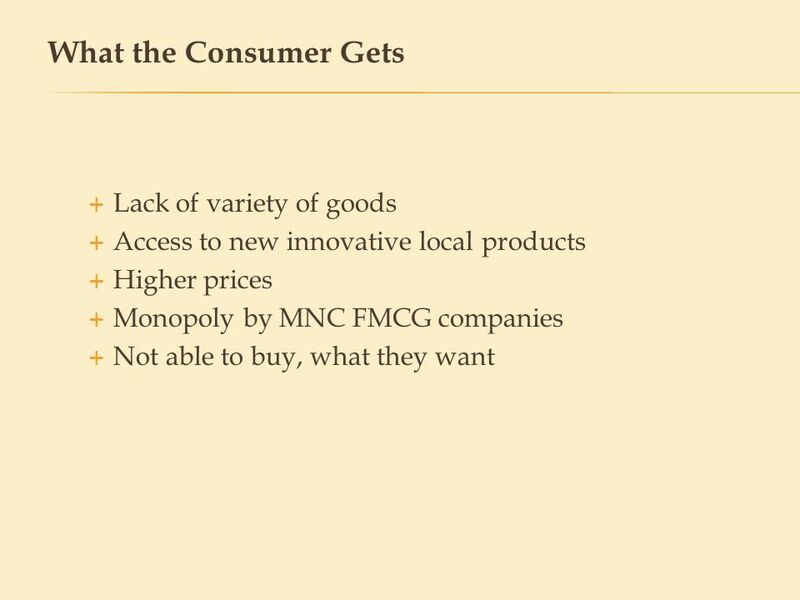 Access to new innovative local products Higher prices Monopoly by MNC FMCG companies Not able to buy, what they want - LACK OF VARIETY OF GOODS: The lack of effective SCM setups being a disadvantage. The consumers do not access to a variety of goods. - Access to new innovative local products : The new innovative Products from Local Small to Medium Size FMCG companies are not reaching the consumer. - HIGHER PRICES: MNCs will globally recognized brands will continue to dominate the shelves and charge higher prices. - Monopoly by the MNC : Unilver, Pepsico, Nestle, P&G, have a monopoly of the consumer goods - Not able to buy what they want: Since the MNCs carry only global brands, which are made for the masses, most of the Products are not necessarily designed for the local buyers. Hence buyers cannot get the Product they want! We often see local products, which adhere to our Taste and Requirements, but after initial access to Shelf at our local Departmental Store, we can never find the product again……..could be several reasons for un-availability but the most important is the lack of implementation of an effective Supply Chain Management. With limited access to local markets and product competing with Global Brands and chances are slim for new Local Super Brands competing directly with the Global Brands. For the overall Economy, this circle results in loss of Billions of rupees worth of potential Brands, which may have resulted in Export and contribution to Pakistan’s GDP. In addition to improving the lives of the consumers. 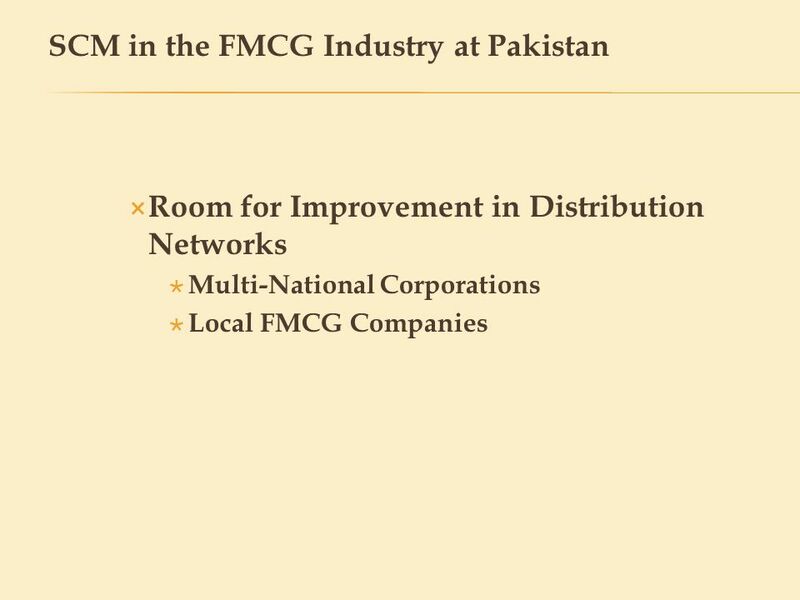 We should setup workshops for the Local FCMG Manufacturers for SCM technical schools and there is Potential for professional SCM consultants in the FMCG industry. The Consultants can help the Local Small to Medium FMCG companies be more competitive. 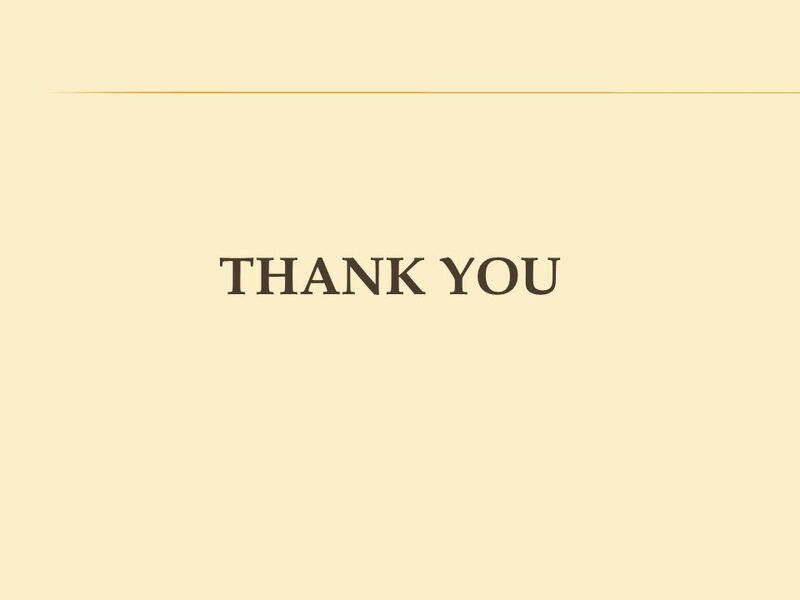 Download ppt "AMIR MUNIR CEI Logistics / DB Schenker"
N What have we learned?. ¿What is a Supply Chain? The set of all customers and suppliers of a company. 1 Inventory Control & Introduction to SCM Pradip Singh Assistant Professor AITM Varanasi. 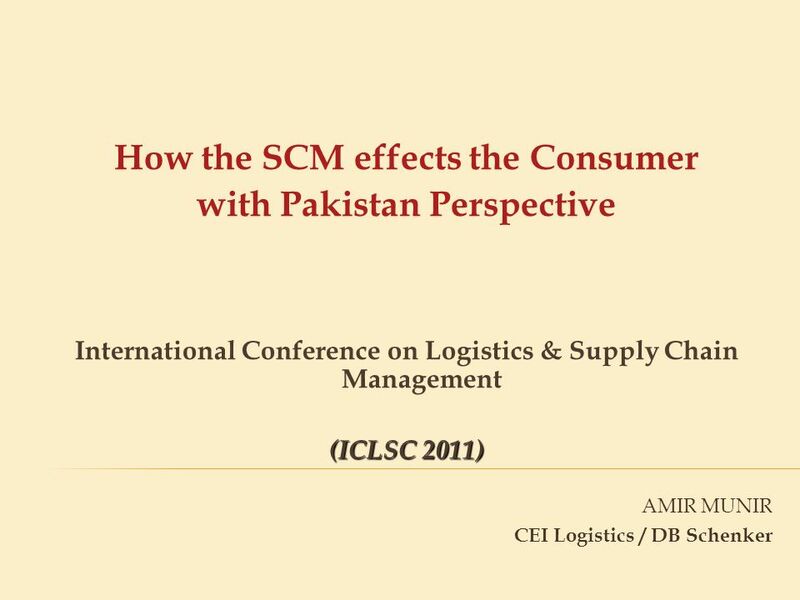 SCM: Information distortion1 Supply Chain Management Demand Variability and Coordination in a Supply Chain. Supply Chain Management Systems Lindsey Palmiotto Deanna Nicastro. Supply Chain Management Kalakota: pp What is a supply chain? The network of retailers, distributors, transporters, storage facilities and suppliers. Chapter 1: Supply Chain Management. Chapter 1Management of Business Logistics, 7 th Ed.2 Learning Objectives - After reading this chapter, you should. Supply Chain Management AG BM 460. Introduction Hanover Foods – 95% of output is produced under contract Contract w/ store or industrial customer or food. 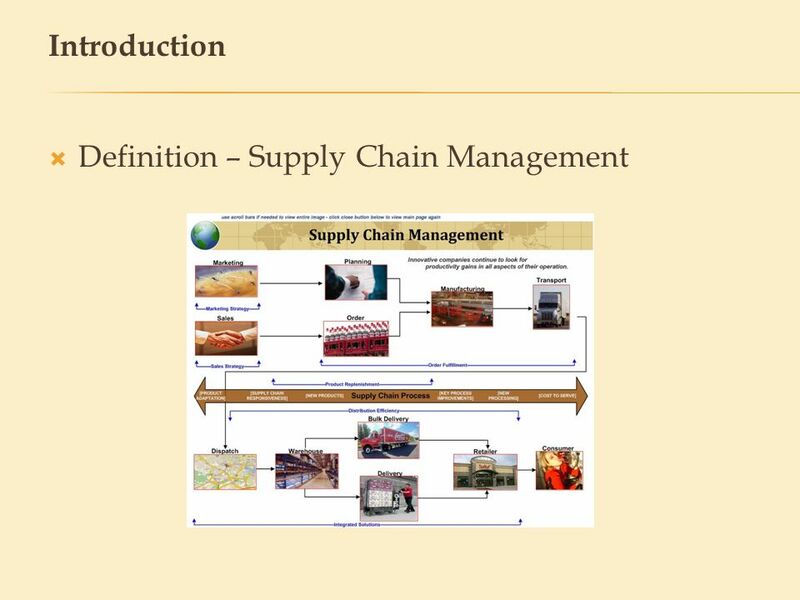 Chapter 1Management of Business Logistics, 7 th Ed.1 BUS 3620 Logistics and SCM We start our lecture to firstly gain the understanding of the following. Operations Management Session 25: Supply Chain Coordination.